New street lights fitted !! Just got home from work tonight to find our local council has replaced all the horrible yellow sodium lights in our street for downlighter LED type lights which seem much better and I would assume more efficient so full marks to York council !!!! This is excellent news, Steve. Do keep us posted about your experiences with the new lights, and how they affect your views of the night sky, now that the nights are drawing in. We've had them around my area for several years now, with my own road being one of the remaining few to still have sodium. I have to say that (to my eyes) my sky brightness has increased slightly since the LED lights were fitted, not decreased. It's Birmingham City Councils hope to convert around 750,000 streetlights to LED in the coming years. At one time I thought this would be a good thing, but now I'm not so sure. I live in hope that our Council is so strapped for cash (and it really is) that they will eventually turn them all off at midnight. However the voices of the "we'll all be murdered in our beds" brigade have already starting shouting from their padded cells, so who knows what will happen! Didn't mean to sound so grumpy. Hope your sky is the better for it Steve! A programme is underway to replace all of the streetlights in Gloucestersire with LED lamps. I understand that dimming will occur between 10pm and 5am for some, whilst others will be switched off after midnight. Gloucester is among the first locations to undergo the switch, and the county council intend to assess any change in skyglow photographically. My own location seems to be as much affected by the illumination of businesses and sports facilities as by streetlights. Nevertheless the Gloucestershire programme is a significant development. My Local Authority is part way through the change over from a mixture of high and low pressure sodium to LED street lighting. I've been measuring the sky brightness using a Sky Quality meter, as I've done for the past two to three years. In the next 12 to 18 months I will have the facts as to whether LED streelights make my sky brigher or darker. The LED street lights are much better targeted than the lamps they replace, but they illuminate the highway to a level about 2-3 times brighter than the old lights. My local authority is installing a central management system where they can control each lamp individually including dimming each or any light by up to 50%. I introduced myself to the local authority and am providing them with my light pollution data. They have been very positive and have taken on board many of my suggestions such as adjusting the light fittings so they do not spill light into the sky. They are currently formulating a part night dimming policy and have invited my input. If your local authority is planning a central management system for the street lights then you should be talking to them so as to influence the lighting control policy ...its your chance to control your local night sky. This is one of the new lights, I assume its one of the dark sky friendly type?. Its certainly helped at my location! We had LED lights fitted around our neighbourhood a few years ago. I think the sky is not quite as bright, but if you happen to catch sight of one they can be quite dazzling. They've offered to fit a directional baffle for me if I feel any particular light is a problem. I've not yet taken them up on that (and goodness knows how long it would take before it was fitted!) but it is useful to know. There is an offer of baffles but when I requested them, they fitted them behind the light, darkening a neighbour's garden and when I requested a side baffle I got the reply "Sorry , missus, not under the contract!" It will be interesting to see how Peter's data turns out and whether LED streetlights are generally a good or a bad thing. The fact that road lighting levels with LEDs are so much higher, even in residential streets, seems highly unnecessary to me and I don't know if there is much we can do about it. There is also a problem for imagers in that the LED light is broadband and much more difficult to filter than sodium. In Chelmsford many residential streetlights are turned off after 1am (it was midnight but the local, environmentally friendly, LibDems kicked up such a fuss that the Council changed the time). Despite the local paper predicting mass murder as a result ("Chelmsford returns to the dark ages...") recent crime stats have shown a reduction. It certainly makes a big difference to my skies. So you`ve managed to go one better then Nick and get them to actually turn the things off albeit at 1am ;-). Yes it will be interesting to see how Peter and his council get on!. Since my area has had these new lights installed I have noticed that there has been a proliferation of lights being fitted by front doors and extra security lights in back gardens, some houses look like floodlit football pitches. All in all, no darker. New LED lights were installed a few months ago here, replacing an eclectic mixture of sodium and incandescents of various ages. I can't make an informed judgement of the effect since there have been so few clear, dark nights this summer and autumn. However, my current impression is that a certain reddish tint to the night sky has gone but overall, the effect may be negative since the Milky Way has not been the impressive sight it was sometimes last year. The downside for me personally is that the new light fittings have four "bulbs" and are wider than the old ones, leading the new light near our house to shine further into the back garden than its predecessor - it shines directly towards my observatory, carefully sited in the (previous) darkest part of the garden. SO I am very interested in what markjones and petabosley said about baffles. Any advice in how to request them from the Local Authority and on whether there is any prescriptive right to have them installed would be gratefully received. That's a very interesting study. These new lights seem to be appearing gradually in Preston - two have appeared in my road over the last couple of months. They seem well sheilded, but much brighter. As they are "white" in colour, what are the options for effectively filtering them out? The trend seems to be towards the use of white LED lamps. Filters such as UHC filters will block much, but not all, of the light emitted from these lamps. 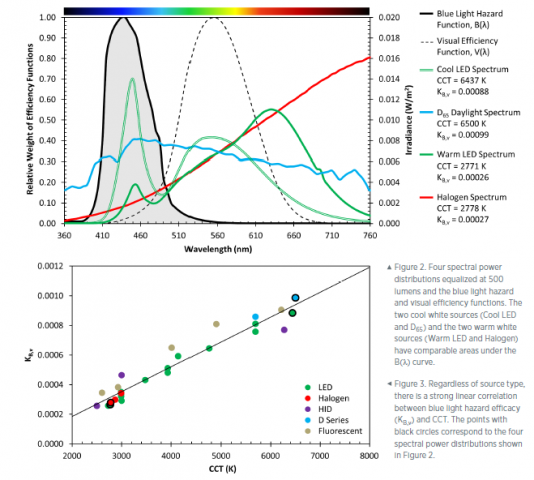 This is because white LEDs have a continuous spectrum across the visible range. Well I have to say since my initial optimism with these new lights installed I`ve hardly done any observing!!!. The new LED type lights are better in only one sense. That is that they are more directional, but and it is a big BUT. They are not properly designed so as to be directionally correct. By this I mean they can be seen from several posts away. You should not be able to actually see any light from the head unit more than 1 post away. The only light you should see if properly designed and implemented is reflected light from the post or the lit areas, not the actual lights in the headf unit. The other problem as many are now finding out is that these new LED lights are full spectrum. If they had been designed to simulate Sodium and or Mercury we could filter out any pollution from backscatter. With ful spectrum this is now impossible. Any direct or indirect scatter into the atmsophere will be impossible to filter out. Hence if in a badly affected area imaging and observational astronomy will become impossible. It is about time lighting was properly designed so as not to affect the night sky. There is a petition on a government web site here please have a look at it. There has to date been no email trouble from anyone signing it. Please read the rules on the site it is safe. Only one reply email from the site will be sent and that is to make sure you only vote once and are a real person. I can't be the only devious so and so to consider flooding hardware store customer review web pages with 0 out of 5 star ratings for rubbish external lights, plus a few choice comments, can I ? One of the reasons for moving to Normandy, apart from the good food and drink, was the dark skies. I have been living here for 15 years, but I still marvel at the milky way, which appears so bright that I don't really need any dark adaption to see it. It becomes difficult to believe that people can't see it. But I am reminded every time I visit family in the UK as to the high level of light pollution. Interestingly the french view on outside lights is that they provide light for the burglars to help break in. If its all black they need to use a torch and can be seen. Any campaign to limit night lighting gets my support. I would like everybody to be able to see what I can. This article in today's Independent talks about the impact of white LEDs on human health. Dr Mario Motta, amateur astronomer and member of the American Medical Association, will be talking about this emerging problem during the BAA summer meeting (during the Sunday session). Wokingham Council have replaced the Sodiums (but left a few high P ones) between Reading and where I live. I am above the lights and see the down-lighting. Its very effective, and I assume many lamps in the Wokingham area (about 5 miles away) are also upgraded. I have not seen any further deterioration in light pollution due to LED lights at my location. Im on the dark end of Bortle-5 (SQM 20.3). I continue to use LPR filters for wide angle imaging and I dont think this will ever change. Given what has been said here, close proximity of these lights and their shear brightness is a serious problem for astronomy. It does to some extent. I contacted Essex County Council about turning off the lights from 12 instead of 1 to 5 am stating that it would save them money. I got a reply from a 'Customer Services Officer' with a link to the lighting section and council policy which seems to be set in stone ! Jeremy, there is also the issue of the impact of white LEDs on nocturnal animals ! They just don't get it !! I contacted Dr Mario Motta and received all the reports, etc he referenced at the BAA meeting. I asked for them because when I returned from the Warwick sessions and asked Northumberland County Council what they'd deployed (under a Freedom of Information Request) they said "5700K for streets and 4000K for the (Dark Skies) National Park". I have four 5700K lights each within 25 yards of my house. Whilst there is less scatter than the old sodium lights, these are the worst offenders for suppressing melatonin and disruption of the Circadian rhythm. There is real concern from the National Park management. I'm preparing a briefing from the five papers received from Dr Motta to send to the NCC, the local NHS and National Trust. And, if necessary, the local news programmes. If anyone wants the reports please contact me. Hi Robin, put simply, a blackbody of a given temperature will display a particular colour that is unique to that temperature. A general light source appearing to have the same colour as the blackbody is said to have a colour temperature that is equal to the physical temperature of the blackbody. Yes I understand the concept of colour temperature. I was looking for a quantitative measurement method. I found these spectra of various LED lamps with their rated colour temperature. Hi Robin, to predict the colour (chromaticy) of a source requires convolution of its spectrum with the colour receptor profiles of the eye (or equivalent standardised profiles, such as those of the CIE); two convolutions are required, the third can be found via normalisation, x + y + z = 1. This allows a plot of x and y, say, on a two dimensional 'colour triangle', with 'red', 'green' and 'blue' at the 'corners'. A blackbody has a locus of x, y values running across the 'triangle'. The method then boils down to matching the x and y values of the light source with those of a blackbody at a given temperature (as closely as the values allow). Chromaticy can also be measured using a chroma meter. Hope that helps. If you search CIE colour space you'll find all the maths for doing the calc. Wiki has a good page on the subject (could have saved my thumbs by pointing you there in the first place!). It has limitations in the sense that calculated or measured colour, expressed by two numbers, x and y, is instead represented by a single number, temperature. It is possible for different pairs of x, y values, i.e. different colours, to correspond to the same CCT. It's a straight forward calculation to do with a short computer program and I would invite somebody (not me) to do it for a representative white LED to confirm where it would be located in terms of x and y, and how this location compares to the locus for a blackbody. I suppose what I'm saying is one should be cautious when specifying or referencing CCT unless one has the x, y data (or whatever standard is being applied) in their back pocket. Here is a plot comparing different light sources wrt "blue light hazard"